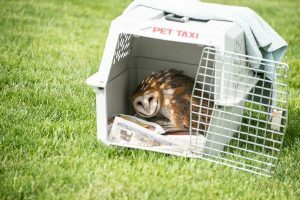 We are extremely happy to announce that after their extended stay at Medina Raptor Center, we have released the Barn Owls! Although they were already flying late last fall they did not learn to hunt until this spring. We want to provide our patients with the best possible chance of survival, and so choose to release them only when the conditions are favorable. Barn Owls are a migratory species and head to warmer weather in the winter, so for these two it would be unfair to release them in the winter when food sources are scarce and the temperatures are low. With that in mind, we waited until we knew they had learned to hunt on their own and night-time temperatures no longer dropped below freezing. 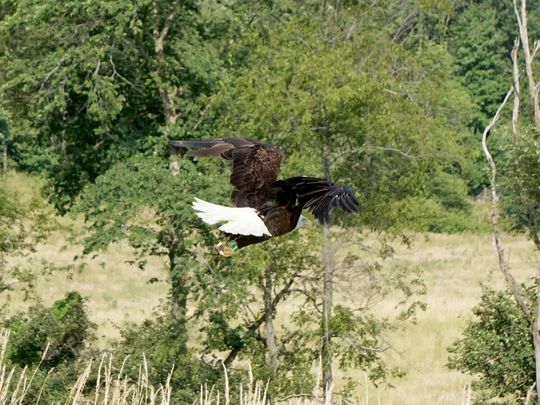 Because these birds are of special concern to Ohio, MRC coordinated with the Ohio Division of Wildlife and so we partnered with two Wildlife officers to have them present for the release. We also made this a very private affair, having only two MRC volunteers and the Wildlife officers present. Although these two were a very special and famous pair for our Center, we felt that the fewer people that were there, the best chance these two would have to fly free and have a long, successful life. As releases go, the se two did not disappoint is making our spirits soar. We opened the travel crates to let them come bursting out at the first sign of blue sky and…nothing. The birds were both very appropriately defensive of humans nearby and preferred to remain in the crates. Although this may seem disappointing, for us this meant that they had a healthy aversion to humans, which they should. Eventually, Laura, our director, decided we should get them out of their respective crates and release them by hand. 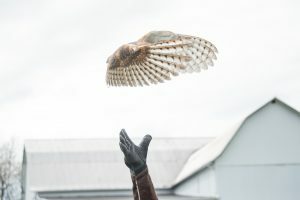 The first one to come out was the male, and she gave one of the Wildlife Officers instructions on how to properly handle the bird with the glove provided. These owls are wild animals with sharp beaks and talons and they can cause a lot of harm when they try to defend themselves! 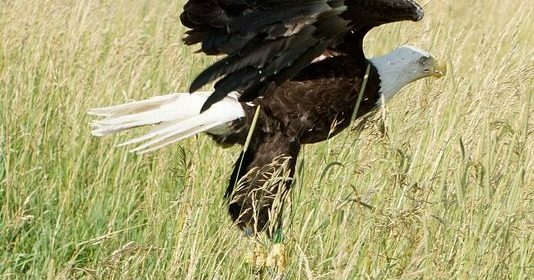 The male came out and the officer placed him gently on the ground; after a moment of standing defensively, he leapt from the ground and took off for the sky. It was a breath-taking moment! 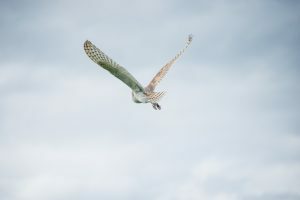 With a few silent wing-beats, he was high in the sky, banking only once to get his bearings before turning once more, heading for the open fields beyond. All we saw were tail feathers as he flew gracefully out of sight, on for open pastures full of mice. Then it was time for the female to be released. Laura once more retrieved the owl and handed her to the Wildlife officer. She was just as defensive about us as her brother, and ready to go. The officer lifted his arm and opened his hand and she took one hop up from it and headed off in the same general direction as her brother. 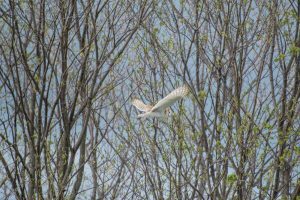 We were ecstatic by the flight and with strong beats of her wings, she banked toward the trees before she took up a perch within one of the trees on the property. Some fellow Red-winged Blackbird residents were not happy with her decision, but like any owl, she held her branch and remained there, surveying the area. The work that we do for these birds is extremely meaningful, and every bird that is released, whether it’s a Goldfinch or an Eagle is just as exciting for us. 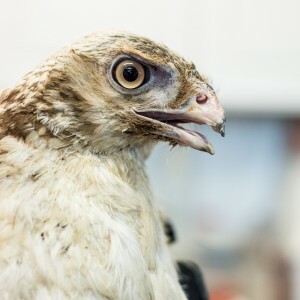 These birds come to us because they have been injured in some way, and we are so happy when we are able to heal that injury so that they can once more go back into the wild. Valor, nicknamed “Valorie” since we have come to know that she is actually a female, came to us on August 30, 2015 after flying through a methane gas plume. These plumes are extremely dangerous to raptors and other birds since they cannot see or smell them. As soon as a bird flies over one of these plumes their feathers instantly singe off and they fall to the ground like a rock. Our previous two cases of methane burns have been success stories but Valor is by far the worst case we have seen. Valorie continues to improve as she has shed off the burned and damaged sheaths to her talons, as well as the the dead keratin on her beak. 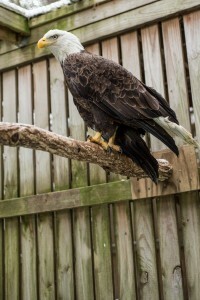 Her talons have been growing quickly, with the normal black returning to her talons, telling us that the tissue was not permanently damaged by the heat. The picture to the left shows the new, pink beak that she has. Because of this, she has graduated from having her food chopped up for her to actually being given whole food so that she may tear at it. Valorie seems to prefer the whole food as it most likely gives her necessary enrichment while she continues to heal. Even happier than her beak and talons growing in normal, we noticed the first week of March 2016 that she has a brand new feather! As you can see to the right, it is one of her primary feathers that is coming in, and it so far appears to be a healthy feather. 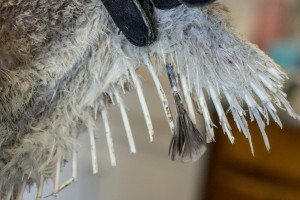 When feathers grow in, they have a supply of blood in the shaft, and we can easily see that blood is being supplied to the feather. This is very important to see as it means that the damage may not be to the follicle. She remains extremely feisty and is making more progress than we had anticipated her total recovery and rehabilitation will probably require 2 or 3 years. During this time she will need several trips to the vet, specialized treatment and lots of food. We are anticipating her recuperation will cost upwards of $3000. Please help us help this incredible bird by contributing to our Go Funding Account to ensure he will survive and thrive once again.